Atmospheric scientist Charles Bardeen about the day the Earth burned. 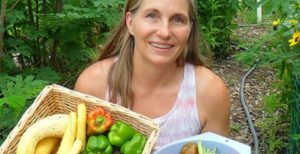 Grow-your-own-groceries gardener Marjory Wildcraft: how she weathered Hurricane Harvey. A shocking warning for the Northern Hemisphere from Danish scientist Jørgen Steffensen. Prime Minister of Dominica tells the UN his island Eden is “broken” by climate change. But first a sad voice from the front lines of climate change. The island of Dominica was a jewel in the Caribbean. It was a United Nations Heritage Site whose mainstay was eco-tourism through the lush forest. All that green was wiped away by the Category 5 Hurricane Maria – powered by hotter than normal seas. Even as the islanders struggled out of the wreckage of their homes and lives, their Prime Minister made it to the United Nations in New York. He spoke these words to a nearly empty chamber, where few cared about the end of Eden. That was a selection from the speech made September 27 by the Prime Minister of Dominica, Roosevelt Skeerit. Find a You tube video of his whole speech here. Can anyone prepare for emergencies like Hurricane Maria in Puerto Rico? How did Texas preppers do in Hurricane Harvey? Whatever trying times may come, Marjory Wildcraft has helped hundreds of thousands get on the pathway to resilience, and a better life. Marjory founded “The Grow Network“. She’s the host of the Mother Earth News Online Homesteading Summit. Marjory has been featured in National Geographic. Her DVD series “Grow Your Own Groceries” is phenomenally popular, as are her many You tube videos. Marjory was last on Radio Ecoshock on April 8, 2015 in a show called “Feed Yourself”. I knew from watching her Grow Your Own Groceries DVD that Marjory and her family were homesteading in Central Texas. They are all about self-sufficiency (within a community) and prepping. We talked about how they prepared their home for the torrential rains of Hurricane Harvey. The Wildcrafts knew that Central Texas is all about years of drought followed by floods. They just had the years of drought, so Marjory’s husband figured the flood was next. So even with the ground bone-dry, he dug out trenching around the house and installed a drainage system known as “French drains”. The neighbors wondered why anybody would do that during a drought, but when Harvey struck, they came through just fine. We discussed how to prepare for disasters, and how a garden can be prepped as well, to handle anything from high winds to a heat wave. With her Grow Network friends, Marjory is a deep well of information we all can use. I also ask whether listeners have to move to the country to grow our own food. Marjory comes up with a list of things that city dwellers can do. I agree with her starting point, which is find a spot in a community garden if you can. If not, maybe you need to help start another community garden? That’s where you meet folks who know how to grow good food. Speaking of growing in the city, the late Mel Bartholomew, the founder of the square foot gardening technique, later in his life came out with a new system. If city soil is polluted or questionable, he says just build a raised bed of good stuff on top of it. But Mel suggests people use peat, which isn’t sustainable if we all use it, and lots of commercially-produced fertilizers. What are your thoughts? Marjory and I also agree that if your diet is just super-market food, you probably can’t build good long-term health. That food is designed for shipping and making money, even if it’s labeled as “organic”. So many vitamins and micro-nutrients are lost in the commercial agricultural food system. The more you can grow your own, the less you may need doctors in the future. Wildcraft is also building a stock of knowledge on alternatives to mass medicine. I agree hospitals are becoming dangerous places. Tens of thousands of Americans die each year from infections they got in the hospital. It’s also true that the World Health Organization is just one voice among many warning that over-use of anti-biotics is making many of those wonder drugs useless. But I don’t go quite as far as treating my own snake-bites or trying to avoid the dentist. It’s all about your personal choices. Of course, as the people of Puerto Rico discovered after they were blasted by Hurricane Maria, you may not be able to find a working hospital in a real emergency. You may want some alternative medicine guides around. At one point, Marjory writes she is sick of hearing how DNA determines health, and that a more healthy life style can change DNA. It can’t, but I do have a recording made a few years ago about the cutting edge research into “epigenetics”. They find that changes in living can turn on some genetic possibilities, and turn off others. So she’s correct in a way. This is kind of technical, but if you want to know more, here is the talk: “Epigenetics, How Does the Environment Get Under Our Skin” recorded by Alex Smith. I enjoy talking with Marjory, and I’ve learned a lot from her. In just one example, I used the calculations found in the Grow Your Own Groceries CD set to figure out how much rainwater I could collect from my house roof – and how much water I might need to keep my garden alive. We installed one 250 gallon water tank on one side of the roof, and 7 50 gallon barrels on the other. These filled up easily and quickly in the spring rains. I saved all that in case we had a drought – in which case the local region can declare a Level Four Emergency. People are supposed to stop watering even home gardens at Level Four. But our garden is my grocery store! We did have the drought this year, with no rain for 2 months. Level Four was declared – but we have enough water stored up to keep the garden going for another month. Prepared. Marjory is writing a book. She is putting out a series of videos, and asking for viewer feedback, to help improve the book. Life on Earth is full of surprises. One peaceful day 66 million years ago, in a climate quite like our own, an asteroid crashed into what we now call the Gulf of Mexico. Nothing has been the same since. New science published this summer in the Proceedings of the National Academy of Sciences has shed light on this mysterious catastrophe. To see what we can learn, I’ve reached the lead author, Dr. Charles G. Bardeen. He’s a project scientist at the National Center for Atmospheric Research in Boulder Colorado. That may sound like deep time climatology, and it is – BUT – it helps us understand a few things about our present and future. For one thing, it’s still possible for Earth to be hit by another asteroid! Sure NASA can watch for them, but despite Hollywood movies, we don’t really have a way to intercept and stop a large asteroid. Smaller asteroids go by all the time. This case study also gives us more information about what could happen after a major nuclear war. When dust gets that thick that it blots out the sun, plant life dies. It’s likely most or all of us would die with the plants who feed us. One key factor is whether the dust reaches the upper atmosphere, the Stratosphere. Lower dust gets rained out in a few weeks, but can persist in the Stratosphere for a few years, blotting out the sun. This soot included extra-terrestrial materials from the asteroid, but also 75,000 million tons of soot and charcoal, which could only come from burning everything on the surface of the planet. It was a global fire!! They took the amount of soot (based on geologic record) and put that into a modern climate model. It’s fascinating to know that when the asteroid struck Earth, our planet was already in a hot time, with no ice at the poles. First the fragments of asteroid and earth came back into our atmosphere, igniting what Bardeen describes as an “almost global fire”. Scientists can find signs of that great conflagration embedded in rock. Most animals were fried. Ocean life continued, but a lot of that died too, in the two or three years of eternal darkness that followed, under the deep cloud. It’s amazing life survived at all. I guess that’s the good news. I find this history of wild times on Earth fascinating. You can read a good article about all this from the University of Colorado here. We hear warnings from expert scientists. And then there is this. The invaluable Peter Sinclair caught up with Danish ice scientist Jorgen Peder Steffensen, and posted a five minute video. You need to hear it. Jorgen Peder Steffensen was recorded by Peter Sinclair, the founder of climatecrocks.com. The title is “Inside the Experiment – The Climate Does not always Play Nice” as published October 3rd. Find a link to the video here. Thank you Peter for your dedication. I’m Alex Smith. Thank you for listening, and letting yourself into the awful truth. Let’s keep trying. And as always, I’m looking for listener support to help me keep producing Radio Ecoshock. The radio stations get this program for free. I don’t get paid and I have production and distribution costs to cover. Please see how you can help here. One thing Marjory touched on is about what happens when the electric grid goes down. Sounds like she lives in a rural enough setting that they can have generators, and their own water supply, and septic. For folks in urban and suburban areas, we typically rely on the electric grid for, basically, EVERYTHING! When it goes down, not only does refrigeration go away, also does natural gas delivery, along with municipal water supplies. All of us in urban and suburban settings are screwed! One final thought: no, the electric grid in the continental U.S. is NOT one monolithic thing. Far from it!